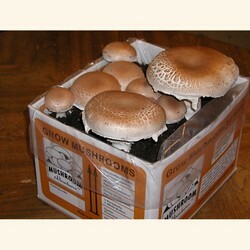 Portabella Mushroom Kit, Portobello mushrooms, fun, easy, grow mushrooms at home, fun, easy, mushroom adventures. Mushroom Kits are Available Now. They Make a Great Gift. We ship Monday thru Friday FedEx. We are Selling Mushroom Growing Kits Now. Mushroom Kits available from Sept. thru April. We have been making Mushroom Kits since 1996, 23 years. Buy from the Best. 8am - 5pm PST. Online sales preferred. A complete ready to grow mushroom kit all you add is water. Grows multiple harvests of mushrooms. Allow 3 to 10 days for delivery. This product is New, we are the manufactures. The heirloom portabella mushroom is one of the most popular eating mushrooms. Often cooked on a BBQ to enhance it's flavor and eaten as a hamburger. It is just as often sliced and saute to be used as a side dish. Stuffed portabella are also a wonderful treat. Our mushroom kits grow several crops of mushrooms over a 2 month period of time. For more information see our description below. Mushroom kits come in 2 sizes 12 lbs. and 6 lbs. pricing and outer box options maybe viewed below. Mini kits will grow smaller Portabella's. than the full size standard kit. Shipping charges are calculated at time of check out. The reason we like the Heirloom Portabella or Portobello strain is because it consistently grows large size mushrooms with little to no effort. These mushrooms are thick and can often grow as large as 5 to 6 inches in diameter. It is amazing to see and taste the beautiful flesh of these giant mushrooms. It is truly one of our best mushroom kits. If the mushrooms are picked smaller they are called Crimini's. No matter what they are called they taste great. The kit is complete all you add is water. Kits are time sensitive and should be started within 10-21 days after there start date. Start dates can be delayed if the kit is refrigerated. These mushrooms are grown on pasteurized compost and do not smell. All mushroom kits can to some degree attract small fungus gnats this is normal. Shipping charges are calculated at time of check out. Contains: Inoculated mushroom compost, casing and instructions. All you add is Water. It is complete. Mushroom Kit Dimensions: Length 12",Width 10",Height 8". Mini Kit Dimensions: Length 9 1/2", Width 7.25", Height 7 /1/2"
Shipping Weight Regular: 12 lbs. / Grows up to 4 lbs of mushrooms total. Ship Weight Mini Kit: 6 lbs. / Grows up to 2 lbs. of mushrooms total. .Outer Boxing Available! Nondescript packaging: Choose "Plus Outer Box". Your order will be placed in a second plain brown box so the recipient will not know what is being delivered. This feature can also help mushroom kits survive shipping during harsh, cold weather. Choose "Plus Outer Box" in the product selection above. Please Note: Our mushroom kits are not Certified Organic, only our fresh mushrooms are Certified Organic. Our mushroom kits are a live product and therefore require attentive care. You have no items in your cart. Shop our Mushroom Kits to add a kit to your cart. To place an order over the phone, call Mushroom Adventures at (530) 741-2437 between 8:00 AM and 5:00 PM PST or Contact us online. Your Wishlist has not items. Shop our Mushroom Kits to add products to your Wishlist or you Shopping Cart.